You asked for it. We baked it. 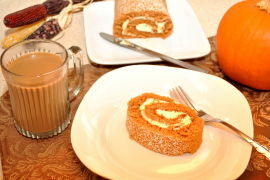 The BAKERpedia team approves this traditional pumpkin roll recipe. Creamy and moist, this dessert piece will sweetly wrap up your dinner. Preheat oven to 350oF (175oC). Grease a jellyroll pan and line with wax paper. In a mixing bowl, beat eggs on high for five minutes. Gradually add white sugar, pumpkin, and lemon juice. Add flour, cinnamon, salt, baking powder, and ginger. Spread batter evenly in pan. Sprinkle pecans and press them lightly into the batter. Bake for 10-12 minutes, or until a toothpick comes out clean from the center of the cake. Remove pan from the oven, loosen the edges and roll the cake up in the wax paper. Cool for an hour. Mix powdered sugar, vanilla, butter and cream cheese together until smooth. Unroll pumpkin cake and carefully peel off the wax paper. Lay the cake back onto the wax paper and spread with filling. Reroll tightly and twist ends of waxed paper like a piece of candy. Place the pumpkin roll in the refrigerator and chill for at least 4 hours. Before slicing, dust with powdered sugar.